Once there were three bears. Their names were Billy Bear, Bertie Bear and Bathusella The Very Reverend Bear of Great Knowing. 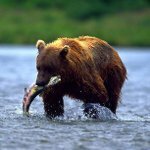 Billy Bear really loved to catch and eat fish. He loved everything about it. He loved splashing in the river. He loved the patience of waiting for the right moment. He loved his sudden reaction when the moment came, and he love love loved the taste of fish. 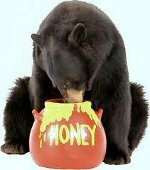 Bertie Bear really liked finding and eating honey. He really loved searching the forest for bee hives. He really loved climbing the trees and knocking the hive down. He really liked his thick fur and skin that stopped the bee stings hurting him, and he really really loved the taste of honey. Bathusella Bear liked telling other bears how to live. Once a week Billy Bear and Bertie Bear went to see Bathusella Bear so that they could be told how to live. Neither of them was sure how this tradition had started, but since as long as they could remember they had been going every week to the clearing near the Great Oak to be told how to live. One of the things that Bathusella Bear was very keen on telling Bertie and Billy and the other bears that came was that they should always strive to be of service to others. He was adamant that a proper decent and happy life could only be achieved if one spent a decent amount of time giving to other bears, and he was also quite keen to point out that a little bit of the giving should always be to him, so that he could carry on with the most special kind of giving that there was - telling other bears how to live. 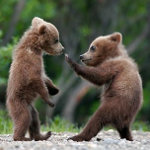 Bertie and Billy had been brought up as good little bears and so always listened to what Bathusella had to tell them. Every day Billy would take one of his fish and give it to Bertie. Every day Bertie would take some of his honey and give it to Billy, and every day they would both take a little something to Bathusella, who would look down his nose at them before grudgingly accepting their offering. Weeks and months went by and tension began to build between Bertie and Billy. For the thing was, Bertie did not really like fish, and Billy did not really like honey. Each felt insulted by the other's offering. Each would put on a nice face and say 'thank you very much', but beneath the surface disappointment bubbled. The tension built and built until neither could contain it any longer and it exploded into a blazing row. Billy poured the honey over Bertie's head and Bertie slapped Billy around the face with a fish. Then they both stormed off like bears with sore heads. Later that week, when they went to see Bathusella, they had calmed down and they asked him if he knew why this had happened. After dosing out a large helping of guilt for their lack of gratitude, Bathusella made a suggestion. "Not all bears like the same thing. So it is best to try to find out what the other bear likes before giving to them. Now you both know what each other like, the problem should not present itself any more!" So the next week Billy decided he would get some honey to give to Bertie, and Bertie decided to catch some fish to give to Billy. But Billy was not very good at finding honey, and Bertie was really quite atrocious at catching fish, and so their offerings were very meager to say the least. Soon the tension began to build again. Billy really hated getting stung and falling out of trees. Bertie really hated getting cold and wet, and he imagined that the fish were laughing at him in a bubbly kind of way. And both of them were very disappointed at the meager gifts they were being presented with. "What is wrong with this idiot?" thought Billy. "Catching fish is easy! He must be keeping most of them for himself." "That Billy is so selfish!" thought Bertie. "A measly few drops of honey for me, the rest for him and that pretty Beth Bear, no doubt!" The tension built up and up until one day. Biff! Squelch! Squiff! Belch! Growl! Scratch! When the fight ended, Billy and Bertie looked at each other, exhausted. "I tried to catch a lot of fish. I really did. But I'm just no good at it. I'm good at finding honey." "I tried to get you a lot of honey. I really did. But I'm just no good at it. I'm good at catching fish." "So why don't we just forget about all this giving nonsense? You get fish for yourself, and I'll get honey for myself, and we'll both be doing what we want to do, getting what we want to get." "Do you know what, Billy old chap, maybe he doesn't know as much as he makes out?" The next week, instead of going to see Bathusella, Bertie went out finding honey, and Billy went out catching fish, and by co-incidence, they passed each other in the forest. "Hey, Billy, how's the fishing going?" Bertie called over to his friend. "Brilliant!" answered Billy. "How's the honey hunt going?" "Brilliant!!" they both said in unison, and waved each other on their way. From that week on, Bathusella's weekly collection was a little bit less bountiful.